The word “debt” might have negative connotations, but the truth is there are many different types of debt and many different reasons to be holding debt. Almost every American will hold debt at some stage in their lives, often for good reasons. Debt consolidation can help keep most types of debt under control in one place. No risk to personal property. If you can’t meet your payments, there’s no need to worry about the lender claiming your home or car. Less paperwork. With a credit card or unsecured personal loan, there’s no need for proof of ownership of your assets or for costly third-party appraisals. Higher rates. Unsecured loans pose greater risk to the lender, and the trade-off is that the lender demands interest rates. More difficult to qualify. Because the borrower isn’t putting up any valuable assets as collateral, the lender will often be stricter when it comes to other pre-requisites such as credit score. Secured debt is any type of debt or obligation that is secured by collateral, such as a house or vehicle, meaning the lender can take possession of the borrower’s property in the event the borrower fails to keep up payments. Mortgage loans and auto loans are 2 examples of secured debt. With a mortgage loan, the borrower puts up their home as collateral. As the borrower’s principal (the money owed to the lender) decreases, the borrower’s equity in the home increases and the lender’s equity in the home decreases. Lower rates. Secured loans pose less risk to the lender, and therefore the lender can afford to offer a lower interest rate. Higher risk. From the borrower’s perspective, the biggest downside of putting up an asset as collateral is that the asset can be seized in the event of failure to make payments. Variable rate loans (or adjustable rate loans) are any type of loan where the interest can change over the life of the loan. Examples of variable rate loans (or variable rate debt, as seen from the borrower’s perspective) are adjustable rate mortgages (ARMs) or credit cards. Variable rate loans are generally favorable to the borrower if interest rates decrease over the term of the loan. On the flipside, variable rate loans offer less certainty than fixed-rate loans and they can also be costlier to the borrower if interest rates increase over the term of the loan. 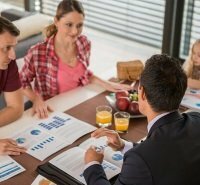 When taking out a variable rate loan, it’s important to consider the loan term: the longer the term, the greater the impact of an increase or decrease in interest rates on the borrower’s payments. Fixed interest loans are any type of loan where the interest is fixed for the life of the loan. For example, when a lender offers a borrower a 30-year fixed-rate mortgage with 5% interest, this means the interest rate will remain at 5% for the entire 30-year term of the home loan. Many borrowers prefer fixed rate loans because they offer a greater deal of certainty than adjustable rate loans. The downside for the borrower is that they deprive themselves of the benefits of lower rates in future, should the rates go down. Deductible loans are any type of loan that can be deducted from your taxable income, such as a mortgage or student loan. 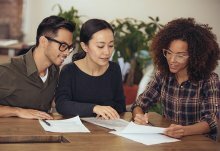 Non-deductible loans are the exact opposite: they are loans such as credit cards or personal loans that cannot be offset against taxable income. The rules over tax-deductible loans can change, and this can cause confusion among borrowers. As always, if in doubt over whether a certain type of loan is tax-deductible, it’s always best to consult an accountant or tax professional. In law, a statute of limitations refers to the period of time during which legal action can be taken. In the U.S., each state sets its own statute of limitations regarding the period of time in which a lender or debt collector can sue a borrower for payment. The statute of limitations varies between 3 and 10 years for debts based on written contracts. In California and Texas it is 4 years, in Florida 5 years, in New York 6 years, and in Illinois 10 years. The word “debt” literally refers to money, goods, or services owed by one party to another party. There are many different types of debts which a borrower can owe to a lender, and it is up to the individual borrower to decide which type of debt suits them in any given situation. 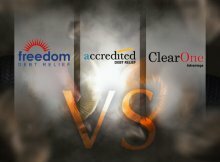 For more information on dealing with debt, see these in-depth reviews of the top debt consolidation programs.